Security doors and screens can be a low cost measure to increase home and personal security. They have both a functional and deterrent value. Many security doors and screens are next to impossible to penetrate and often act as a deterrent for would-be burglars and home invaders. Having to break through a security door to gain access to your house draws attention, attention that most burglars don’t want. Security doors and screens also give the homeowner increased peace of mind, knowing that they are safe in their own home. Hot summer nights can be uncomfortable and stifling. Having security doors and screens fitted to the external entry points of your home lets the cool breeze in and promotes cross ventilation while remaining secure. This allows your house to cool without the need to run air conditioning units leading to a better night’s sleep and reduced energy bills. Many security doors and screens are made from materials that can withstand harsh weather conditions, are corrosion resistant, durable and have a long life, making for a cost effective investment. There’s also few moving parts and little that can go wrong, unlike other door and window systems which can require servicing and painting. Security doors and screens come in a range of colours, finishes and designs with a style to suit any home exterior and customer taste. Depending on the brand and supplier, there are a number of standard colours as well as the option to finish your door in a custom paint colour of your choosing. A number of manufacturers offer sleek modern designs that not only perform well but also look great and value to your home. Enjoy the breeze in summer without compromising your view or security. 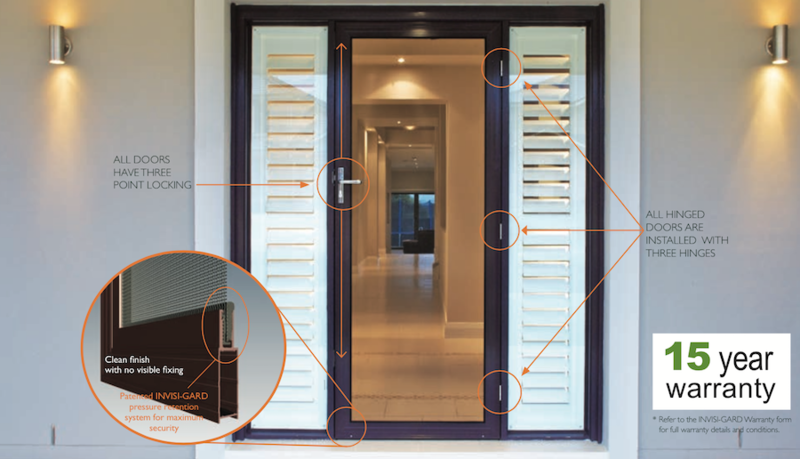 Monaro Windows manufactures the Invisi-Gard brand of stainless steel security doors and screens in its Queanbeyan factory and has product displays on show at both the Mitchell and Queanbeyan showrooms. 316 Marine Grade Stainless Steel Mesh – At the heart of every Invisi-Gard security screen and security door is high tensile 316 marine grade stainless steel mesh. The grade 316 mesh sets the world standard in terms of its quality, precision and longevity. EGP Retention System – Complementing the class leading mesh is a quality retention system, which features the mesh retained in an aluminium frame using a patented EGP (Extreme Grip Protection) retention system. This unique design ensures maximum strength and durability through an assembly technique that avoids contact between the two dissimilar metals – a major cause of corrosion over time. 15 year Warranty – Invisi-Gard is Australia’s premier security screen brand and the entire product range is backed by an industry leading 15 year warranty period. 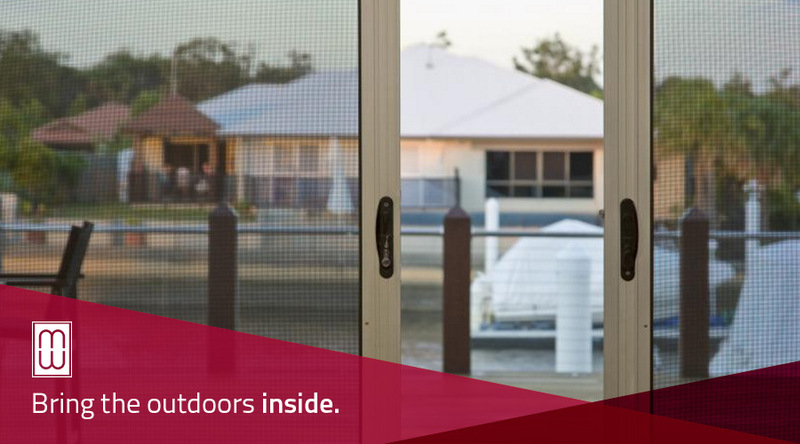 3 Point Locking and Hinging System – The Invisi-Gard security screen door range feature high quality 3 point locking and hinging systems for excellent strength, durability, security and longevity. Colours, Style and Design – Invisi-Gard offers a wide range of colours to match your existing doors and windows, ensuring your new security door and screen perfectly complement your home. All products are available in a made to measure, custom built and installed format, ensuring an optimal fit and product performance.